Premium Italian motor yachts brand Mochi, special edition made in collaboration with renowned architect studio Caliari. This 45 feet beauty is equipped with two new Volvo engines D9 575 HP, new teak deck, sun tent and swimming platform. Ultimate safety issues are met with GPS, plotter, VHF radio system and all the safety equipment meets or exceeds the safety standards set by the Greek Ministry of Merchant Marine (life rafts, EPIRB, life jackets, fire extinguishing equipment, etc.). 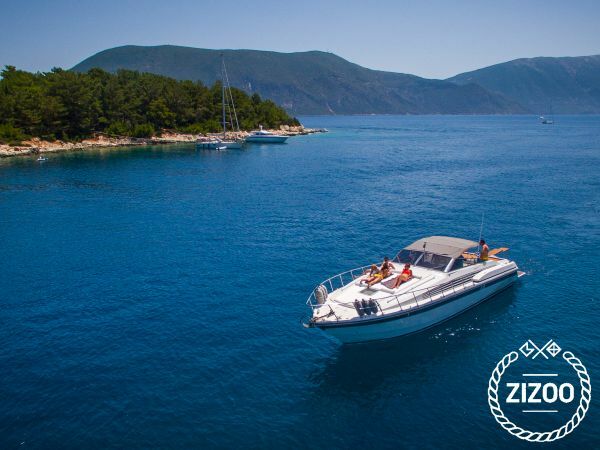 Our location is the marina of Agia Efimia in Kefalonia Island but we can pick you up from any Ionian Island under agreement. Please contact us if you would like to request non-standard check-in and check-out times or locations. Requested 33 times this week!